Super Hero Boy: Staples your holiday go to place! Staples your holiday go to place! Staples may not be one of your typical top of the shopping list stops for the holidays but it should be! They have so many great ideas for last second stocking stuffers and gifts I really had to rethink them on my list as well! What better gift to give a child on your list than an art set from Crayola? Art supplies are by far the one universal gift that children from 2 to even adults can really appreciate. Connor is absolutely obsessed with markers and crayons and I know its the one thing I can pull out if we have guests over no matter what their age to keep them occupied. My only pet peeve about crayons and markers is what to do with them when your done playing. Staples sent over a Crayola Ultimate Art Kit for us to check out and it's the perfect option not only for storing those precious crayons and markers but for taking them with us to grandmother's house! The set comes in a pretty heavy duty plastic case with separated areas for each of the art supplies. Inside is 8 washable markers, 24 crayons, a paint brush, a 8ct water paint, 12 short colored pencils, a small glue, a small pair of child friendly scissors, and 25 sheets of colored paper. All of which are refillable as you run out with Crayola supplies so you don't have to be shy about using any of it. 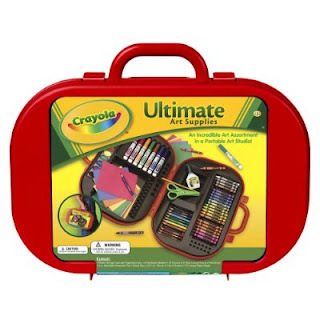 This is absolutely the perfect gift for a school aged child who needs a great set to keep at home to do school projects or even for a preschooler getting introduced to their first art set. Connor is just coming three and we use the crayons, art pencils, and markers but I opted to take out my paints for the time being not because he can't use them but because I'd rather him be a little older before I turn him loose with paints. Same thing with the scissors and glue. We just put them aside for our older visitors to play with when they come. What I really really really love about this set is the carrying case, that alone is worth the price to me as the one thing we always have to pack any time we travel is crayons and they are always the one thing that gets broken. Connor unfortunately is a lot like his Mamma when it comes to his crayons and broken ones are just not as fun. heh. It also makes storage a snap and its really easy just to tuck onto the top shelf of the closet. Staples has a huge selection of Crayola products available both in their stores and online. You can check out the online selection on their website! While your there check out the other great gift ideas Staples has to offer including the Mad Dash Deals which are good for a limited time and only while supplies last!